The War Outside is one of those books that you hug tightly to your chest and let out a deep sigh as soon as you've finished the last page. The story and its characters will embed themselves deep into your soul. The War Outside was a perspective of WW2 that I have never known. I did not know about these internment camps and their existence. It's another heartwrenching fact of that time. Although The War Outside may be fiction, I am sure its story is very true for the people that were involved. I'm sure if they could have read The War Outside they would have found a little piece of themselves in one of the characters. This is my first book by Monica Hesse but it will not be my last. She crafted an emotional story about 2 girls that, despite the rules of society, developed an unbreakable bond. The War Outside is a very character driven novel. It is not a story about a war. It is a beautiful tale about 2 girls with a war happening around them. Hesse approached this story with a fine delicacy. It's as if Haruko and Margot were in the room with her, confiding their stories, whispering their secrets and she was just transcribing them to paper. 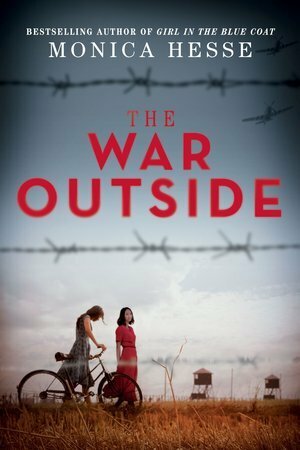 The War Outside is a book that you'll want to savour. You will want to take your time reading each word, not rushing, although it will be tough to not devour it. It's dual perspective will give you a deep look into each character and the own wars within themselves and their families that they are dealing with. Get cozy, curl up with your favourite blanket (and a box of tissues) and delve into the stories of Haruko and Margot, but be prepared, once you meet them, you'll never forget them. I read a book, this book was called The War Outside and I will never forget it. Thank you for reviewing the book. I simply had to say thanks once again. I am not sure what I could possibly have used without the actual tricks contributed by you concerning such a subject. It had been the fearsome condition in my position, but taking note of a well-written fashion you managed the issue forced me to jump over contentment. I am grateful for the service and then wish you comprehend what a powerful job that you are undertaking educating people through the use of your website. I know that you've never come across any of us.